In 1964, Gay magazine is published in Toronto—alongside ASK Newsletter, which began in Vancouver in the same year—was the earliest periodical to use the word “gay” in its title (GLCA). The periodical featured gossip columns, poetry, fiction, photography, personals, while at the same time dealing with political LGBT issues with varying degrees of explicitness. Donald McLeod states that Gay never tried to be hugely political, and was instead intended for a “mainstream gay audience” (76). He lists this as one of its failures. However, during the time period in which it was founded, the ability for gay people to meet was exceedingly difficult, and introduction services provided by Gay were incredibly important since they offered Canada’s first tabloids (McLeod16). Additionally, Gay managed to branch out to Montreal and New York City (36). The magazine is seminal not solely because of its explicit activism, but also because it managed to outstrip American publications, selling about eight thousand copies by 1965 (77). Culturally, then, it is an example of how Canadian LGBT movements could grow independently from the United States; independently, indeed, from the Stonewall Riots, which eventually sparked another wave of gay liberation movements. Unfortunately, Gay only survived until 1966, but it cannot be denied that it set a historical precedent for publishing during a time when LGBT voices were predominantly unheard. 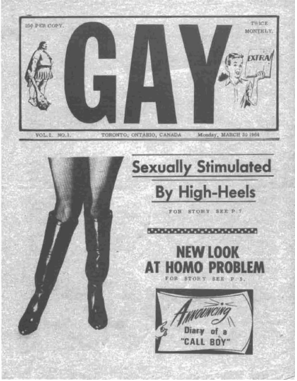 One of the first Gay tabloids, published in March of 1964. It is a clearly provocative tabloid, and received mixed reactions on behalf of the LGBT community. From A Brief History of Gay: Canada’s First Gay Tabloid, 1964-1966. Toronto: Homewood Books, 2003. 1965 – Imprisoned for the last time… but still not free! 1974- The Brunswick Four – Forging a movement! 1992, October 27 – Come out and enlist! 1981 – CBC Broadcast after "Operation Soap"